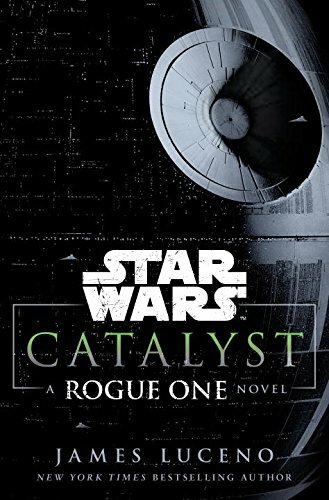 Since ROGUE ONE comes out this Friday, I thought I'd read the book that leads into that Star Wars story-line. A scientist is manipulated into designing the ultimate weapon for the Empire. This book provides the back story that leads into ROGUE ONE, which opens up this weekend. It's not a completely independent story-line. In the pages of this book we follow the Erso family, Galen the scientist working with power crystals, Lyra his wife and explorer and their newborn daughter Jyn. In a way this book is a chronicle of the Clone War from a different perspective. In the prequels we got to see the War mostly from the Jedi perspective. However, in this tome we see how The War effected some of the other peoples and worlds. That's when the Empire decided they needed some super-weapon, something that will convince separatist worlds to fall in line with the Empire. Several officers would jockey for position on this project which would end up as the Death Star. An ambitious Commander of the Corps of Engineers by the name of Orson Krennec decided to make a play so he may ascend the ladder. The book is interesting in the way that it explains how the Empire got the Death Star got built. It also started to get annoying with the perfidy among the Imperial officers as well as the annoying tree-hugging hippy nonsense from Lyra Erso. We, also, finally get to see how the Rebellion was born. The war against the Separatist worlds, what spurred on the Clone War and the Empire, never ended! Worlds that were far off from the Core continued to resist the Empire, so the rebellion was nothing new by the time Luke and Leia got involved in Episode IV. For the most part I liked the book, but I felt that the anti-war message seemed a little overwhelming and seemed potentially too clairvoyant for the situation. Palpatine rigged the war in such a way that it seemed that everyone needed to choose a side, not holding out for a diplomatic solution. Whatever. It gives us some insight into the cast of Rogue One, that is, if they choose to make it canon. In addition, the way the book ends, the reader is left feeling empty: as if there was no pay off for reading this. You have some background, but it leaves you off some 20 years before the events in Rogue One / A New Hope. In other words, I don't think we should've been given a happy ending when we all KNOW it shouldn't be!